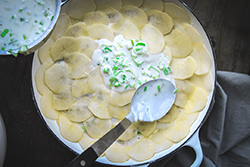 In this classic dish, thinly sliced potatoes are layered with a distinctive Mornay sauce (Bechamel sauce with Gruyère cheese added). 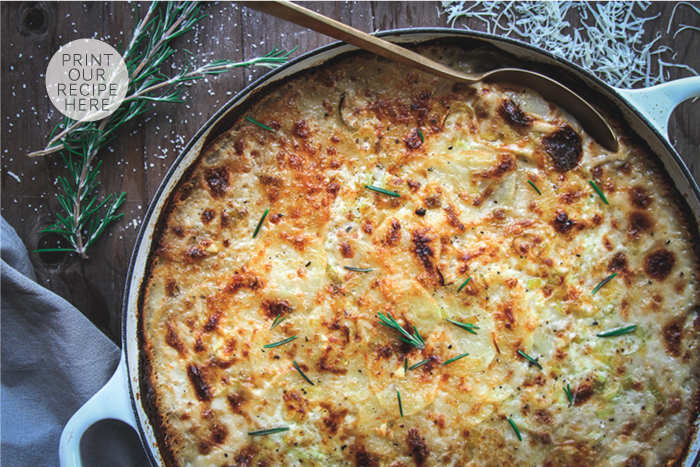 The additions of savory leeks, garlic, and rosemary combined in a wonderful way in the sauce to infuse comforting flavors into every bite. 2. 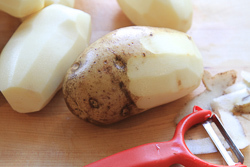 Prep the potatoes using a sharp peeler to peel the potatoes. 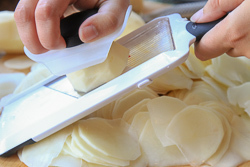 Rinse off, and then slice into 1/8” slices using a handheld mandoline. 3. 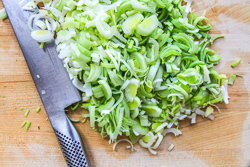 In a large saucepan, melt 1 tablespoon butter and saute the leeks over medium heat until they are softened and translucent about 10 minutes. Add the rosemary and garlic and cook for about another 2-3 minutes. 4. Prepare the roux. In a separate, small saucepan, heat the remaining 4 tablespoons of butter. 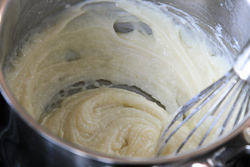 Once the butter has melted, whisk in the flour until the mixture is completely smooth. Continue cooking for about 1-2 minutes. 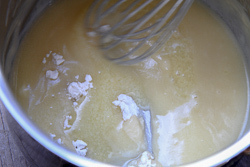 This process removes the raw flour flavor and helps create a silky sauce. 5. Create a Béchamel sauce by very slowly pouring milk into the roux, continue whisking the mixture until the sauce is smooth. Add the salt and pepper and continue whisking over medium-low heat for 3-5 minutes until the sauce thickens and becomes very creamy. 6. 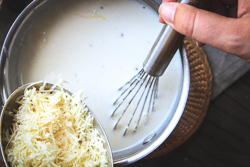 Transform the sauce into a Mornay sauce by slowly adding the shredded Gruyère cheese. Continue cooking and whisking for a few more minutes until the sauce is smooth, and the cheese becomes well incorporated. 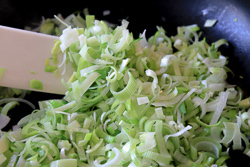 Add the sauteed leeks mixture to the sauce. 7. Layer the gratin. 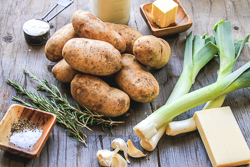 Butter the bottom and sides of a large baking dish and create a single layer of potatoes. Pour some of the sauce over the potatoes and continue to layer the potatoes, pouring more sauce with each layer. Repeat these steps until all of the potatoes are used (or until the top layer is within 1/2” from the top of the dish). 8. Coat the final layer of potatoes with sauce and sprinkle with the reserved cheese. 9. 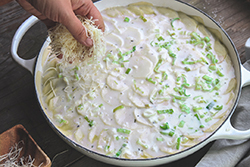 Cover the gratin with a tight fitting lid or foil, and bake for 60 minutes, or until the center is bubbly and the potatoes in the center are tender to the tip of a sharp knife. Remove the lid or foil, and continue to bake for another 10 minutes, or until the top turns golden brown. 10. 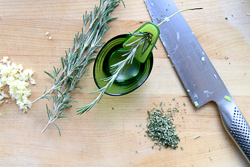 Garnish with additional fresh pieces of rosemary, and serve hot.